View More In Fracture & Cast Boots. The ProCare Nextep Contour Air Walkers provides ultimate protection and edema control following trauma or post-operative procedures. Designed to increase stability and help reduce pain and edema following trauma or post-operative procedures, the Nextep Contour Air Walker also provides a cost-effective option to serial casting. Provides ultimate protection and edema control following trauma or post-operative procedures. A medial/lateral dual air cell system inflates both sides of the liner equally and is easily adjusted with an integrated pump for proper compression, comfort, and custom fit. A secure, full wrap-around shell provides maximum support for ligament and tendon repair, osteotomy, pinning procedures, stress fractures or post-operative bunion surgery. Cushioned, non-slip rocker sole. Washable brush nylon foam liner with toe cover for maximum comfort. 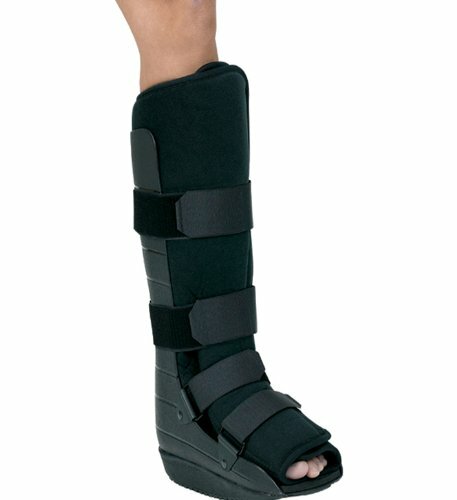 Indications The ProCare Nextep Contour Air Walker provides support and compression to help promote fracture healing. Goals Increase healing. Improve surgery. Decrease anti-inflammatory medications. Decrease pain symptoms. Improve ankle/foot recovery. Comfort & Support. If you have any questions about this product by ProCare Braces, contact us by completing and submitting the form below. If you are looking for a specif part number, please include it with your message.